Making your own homemade salad dressings can actually be fairly simple, and the taste is far superior to the store bought stuff. Plus most packaged salad dressings are full of unnecessary additives (including refined sweeteners) that you would never cook with at home…so this is a great place to start when it comes to making the switch to real food. 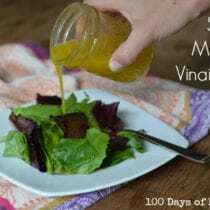 Below is a super simple recipe for the pictured Mustard Vinaigrette along with some other tips and recipes to keep your salads fresh and fun! The Best Salad Dressing Invention Ever! Okay, so back to recipes. Here are a few easy ones to get you started…along with the vinaigrette below! Also, don’t forget – just plain Olive Oil and Balsamic Vinegar! Pour all ingredients into a small mason jar. Put on the lid and shake vigorously (i.e. emulsify) until well blended. Store the dressing in the jar in the fridge - the oil will harden when cold so be sure to let it sit out or warm it up a bit each time before using. Thank you for another great option! I am so grateful that I found this site last month! I am currently working on your 14 weeks of mini pledges, and I am loving it. The reason why I have switched to organic food is a long story but I feel that it should be told. Last July after a long day I was just feeling kind of “off.” As I started getting ready for bed I started feeling like I had indulged in too much wine, but the funny thing was I had none. All of a sudden I couldn’t walk, I literally forgot how to walk! My husband rushed me to the emergency room where they ran a million tests. Everything came back negative so they sent me home and told me that I probably had bad vertigo. Long story short: 4 doctors, 12 different meds, 7 months and 5 different diagnosis proven to be wrong through testing later, my neurologist suggested that we start back from scratch. He decided to take me off all meds and try something new. He asked me to make three changes to my diet, no MSG, no artificial sweeteners, and no nitrates. I thought he was crazy but at this point I would try anything. Within a week I was walking around great. I started researching and reading labels on everything! Turns out my neurological system was actually be attacked by these chemicals. And it was shutting down from these poisons! ! How these chemicals are still on the market is beside me! Wow Rebecca….what a story. And wow….I’m surprised your dr suggested food bc most wouldn’t…..So that’s great. You should look for the book Excitotoxins by Dr Russell Blaylock (spelling?). Its about msg and other additives….its on my list to read. Thanks for sharing your story!! I hope you stay healthy. Love the dressing bottle too!! I have used it sooo much! Thanks for the other dressing recipes, Melanie! The Creamy Caesar-Style Dressing sounds great! Love the bottle! I need to look at getting one of them. Thank you for the recipe! Love homemade dressings. 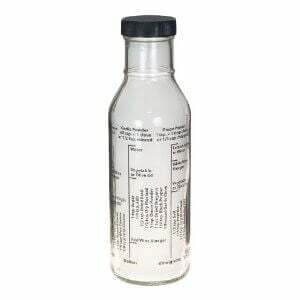 Here’s another salad dressing bottle that I’ve used for years that is comparable in price but has additional features that have proven wonderfdul for salad dressing making! In addition to the expensive the recipes/measurements on the side, it also has a whisk as part of the bottle that mixes up ingredients. All is dishwasher safe. How long do homemade salad dressings and dips stay good? I have been interested in making my own salad dressing but the recipes I had come across all seemed complicated or had many ingredients that I did not have. This recipe and the other simple dressing links you provided are perfect for beginning to make my own – and they all have everyday ingredients. Thank you for another great blog. Really the recipe is very simple and is a great homemade dressing. Thank you for sharing the post. I just had a wonderful apple cider vinaigrette dressing at Chevy’s Mexican Restaurant. It had a great sweet taste. What would you think were the ingredient and proportions? Can’t wait to try this dressing tonight! I have been eliminating our processed condiments one by one over the past few months and salad dressings have been gone for quite awhile now. In my search for a solution, I found a ton of great salad dressing options over at the delciously organic website. I have been loving these – especially the maple syrup balsamic vinaigrette a reader suggested and the (very simple!) balsamic and olive oil with a dash of salt suggestion. I use white balsamic and do a 50/50 ratio to olive oil. Then I add a dash of salt and a squeeze of fresh lemon. So light and refreshing! I wonder how this would taste as a marinade for chicken! Wow !! It is really a fantastic recipe. I just want to try our at my home. I love making salad dressing at home. I have found great recipes, that taste so much better than store bought. Can’t wait to try this one! THANK YOU for the quick tip at the bottom of the recipe! I could not for the life of me figure out why my homemade dressings were getting hard so quickly after being made, and thought they had gone ‘bad’ by the time the liquid solidified. Glad to know it’s just because of the refrigerator and that it’s safe to consume even when its gotten hard. Do you know about how long a homemade dressing should still be good after after making it & keeping it in the refrigerator? I can imagine this tastes so good and would be perfect for a summers picnic. Cant wait to try it. i love mustard so will try this. Bet it taste so much nicer then the stores. Homemade is the way to go! I have a number of organic oils (Macademia nut, walnut, hemp, avocado, and of course, olive oil! I have a number of vinegars: apple cider vinegar, blood orange vinegar, mango vinegar, balsamic vinegar, red/white vinegars, etc. I use 2:1 (oil:vinegar) if it is too sour, some would prefer 3:1. Add minced garlic (about 1/4 teaspoon per Table spoon of vinegar), or you can even use garlic powder. Add salt, pepper, and shake – or whisk. Voila! Sometimes I’ll add a little squirt of dijon or even organic mayonnaise for a bit of creaminess. There are no rules to making dressing. Just add, whisk, taste…you’ll figure it out. For an asian dressing: use rice wine vinegar, part olive oil and part sesame oil. Add garlic and ginger and a little peanut butter. Whisk away & add S&P. It’s great! 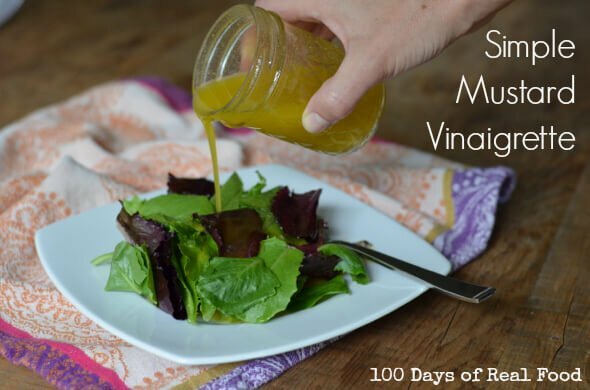 This is the best homemade salad dressing I have tried. Easy and delicious. Thank you ! What brand of olive oil do you use??? Look around. I found this salad dressing jar for under $5.00 and have used it a long time! How do you know which olive oil is good for making salad dressings? Do you use yellow mustard powder or is it prepared yellow mustard? This was really good! I didn’t have yellow mustard on hand, so used 2 tsp of Honey Dijon instead. Otherwise, I followed the recipe. This is now my new go to dressing. Husband liked it, too! I just stumbled upon your website by chance and it looks intriguing; I will definitely visit again. I am a huge proponent of whole foods, myself. In addition to being healthier, whole foods simply taste better. I have made my own salad dressings for years and make one myself that is similar to the mustard vinaigrette recipe you have listed. I noticed that you recommended to store the dressing in the refrigerator, but to let it sit out before serving, as the oil will become hardened when refrigerated. Why do you refrigerate it in the first place? All of the listed ingredients are non-refrigerated items on their own. Is this done simply to have a slightly chilled dressing? Just curious, as I never refrigerate any of my dressings that do not require refrigeration. SO SO good. Thank you! I can’t wait to try the blue cheese dressing too. I make a version of this and have it on hand all the time! I have tried to get away from using mayo so have put my mustard vinaigrette on everything from potato salad to cole slaw–it’s amazing! I use a combo of mustards and especially love the addition of a course- ground mustard. And I always add a little heat with cayenne or chili pepper flakes. The recipe allows for lots of subs of mustard, vinegar (I love Bragg’s apple cider) and the addition of a little fruit jelly if you’re using red wine vinegar or balsamic. You really can’t mess it up! This looks awesome (as does the cool bottle)! I can’t wait to try and make this – possibly making adjustments or at least doing the math for calories when using this in a spritzer. I’m buying the bottle for myself and for a friend who eats clean and has a ridiculous amount of allergies (corn and wheat!). Oh my goodness, this dressing is so yummy. In the past 24hrs, I’ve had it 3 times. This was awesome! I usually just do oil and vinegar on my salad because of the lack of “real food” salad dressings in my grocery store. I cut the recipe in half (in case I didn’t like it–that’s quite a bit of olive oil for a test recipe!). I also used spicy Dijon instead of yellow mustard. I love it. I stopped eating salads months ago because I was sick of just oil and vinegar. I think I’ll have to pick up some more lettuce at the store this week! Do you know how long the salad dressing would last in the fridge in a tightly sealed mason jar? Is there an alternate oil that can be used in this dressing or in ones like a vinaigrette or balsamic vinaigrette other than olive oil…maybe one that is a bit more budget friendly? Hi Tiffany. Olive oil is really such a healthy oil to use in dressings. I would suggest cutting back rather than cutting it out. Avocado oil is another good option for dressings with a neutral flavor but the cost is similar. Hei Tiffany. Put a teaspoon of good quality virgine oil on a small piece of white bread and taste it. Do the same with any other oil so you know by taste the different oils. When I do not want the olive taste in my dressing I use rapeseed or sunflower oil and then put the taste I want into it. For instance with salad and game patee I do not like the olive oil taste. There I use a simple chutney like dressing, maybe cherry jam, chili,garlic and oil. With duck salad I use plum jam, chili, garlic and oil. AND. Never serve anything with more than 5 ingridients. The recipe is perhaps fine as is, but it must match the right salad. It’s taste is actually quite mild and must be matched with greens that themselves are mild (spinach, iceberg, romaine, green leaf). In a salad with bitter greens (dandelion, escarole, etc. ), veggie greens (radish, carrots, etc. ), and/or strongly flavored veggies (red onion, bell pepper, etc. ), this is not the right dressing, getting overpowered by the tastes of the salad items themselves to the point that besides a ‘wetting’ of the greens, it doesn’t add its own flavor. The idea is a good one, and playing with ratios will fix it if you like bitter greens in your salads (more vinegar and/or a stronger vinegar, more and/or a stronger mustard, like spicy brown). I am wondering if I can substitute mustard seeds or powdered mustard for the prepared mustard. I must eliminate sugar/vinegar from my diet. If so, how much would I add? I also plan to substitute lemon juice for the vinegar. Thanks! Hi Margie. That is not something we’ve tired but I think mustard powder should work. This might help in making the substitution: http://www.myrecipes.com/how-to/cooking-questions/dry-mustard-vs-prepared-mustard. Let us know how it goes. Is there away to increase the other ingredients or just add less oilive oil? Hi. You can decrease the olive oil if you’d like. It will have a stronger vinegar and mustard taste. Is it absolutely necessary to put homemade vinaigrettes in the fridge if all of the ingredients are normally stored out of the fridge? I’m just trying to save time by not having to thaw the dressing every time I want to use it. Thanks! Hi. Yes, if you want to extend its shelf life for a few days. I use either whole grain mustard or dijon (instead of the yellow mustard) and sometimes I use dried shallots (that I get at World Market) if I’m worried about being stinky after eating it with garlic, lol. Hi, how long can each of these be stored in the fridge, approximately. Thanks! As an alternative to diet salad dressing, I mix 1 tsp. of prepared mustard and 1 tsp. honey for a side salad. (Yes, I measure.) 20 calories. Just had to compliment your dressing bottle choice. We have that same one, and we absolutely love it!! What would you recommend to increase the viscosity of vinaigrette dressing so they cling a little better to the greens? Hello. I think the mustard helps a lot. I tried this yesterday and it is so good. I just added a teaspoon of garlic powder, so that I can store this on the counter. This way I can use it when I need to and not have to worry about it getting so thick.